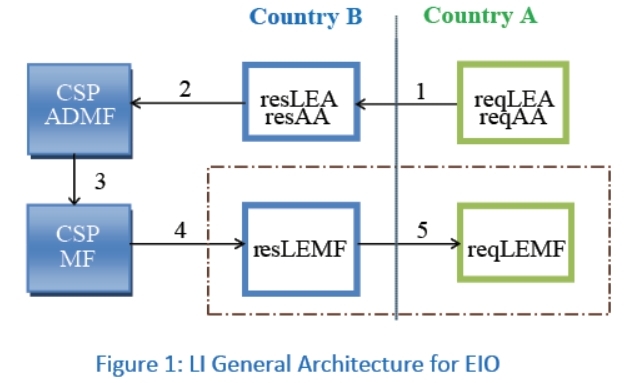 ETSI TC LI has identified a standard LI Architecture reference model to address the new EIO requirements which impose that an LEA of a country (country A) is able to get real-time intercepted product of a target using a communication service in a CSP network located in another country (country B) in certain circumstances. The standard solution provides LI data transfer between different national borders at the LEA’s domain level without impacting the CSP interception domain implementation. The TS supported a modular approach by introducing new HI functionalities starting from the concepts of Requesting Authorized Authority (reqAA) and Responding Authorized Authority (resAA) with the corresponding Monitoring Facilities reqLEMF (in reqLEA) and resLEMF (in resLEA). The requesting LEA or AA sends a message in accordance with EIO  to responding LEA or AA specifying the data it needs. If accepted, the responding LEA or AA forwards this request to the CSP. HI1 standard defined by  may be used for such order towards the administrative entity of the CSP where the target is requested to be intercepted. The CSP activates the request as a pure local request. The responding LEMF sends data forward as IRI IW and CC IW in (near) real time to the requesting LEMF. ETSI TC LI worked to define this latter step 5 interface by writing a new Technical Specification (TS) for Inter LEMF Handover Interface, ref. . 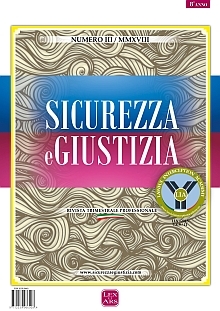 This work had significant support in ETSI by all members types (Government, Network operators, MF/DF system providers) and its 1st TS version was focused only on LI aspects. Figure 2 describes the functional diagram of this new HI, named ILHI, which supports the sending of LI data from the resLEMF and additionally the exchanging of all the control messages (e.g. error codes, keep alive messages) between resLEMF and reqLEMF. For data processing an Interworking function is defined for the resLEMF (resIWF) and for the reqLEMF (reqIWF). The resIWF shall process the data to provide interoperability while the reqIWF processes the data received over ILHI into local format as needed. The resIWF is structured into the three main functions of Mapping (MapF), Interoperability (IopF) and Encapsulation (EcsF) which all manage the LI data received from the CSP to create the PS-PDU with ILHI Payload. MapF is optional with resLEMF deciding if and how it is used to generate a mapping from every element of a given set to a distinctive element of another set (e.g. Timestamp and Location information). IopF shall generate the res Payload in accordance to TS 102 232 family when the CSP Received data is not using ETSI TS 102 232 and forward it in addition to the received data sent as original Payload to the EcsF. If the received data from CSP is already according to TS 102 232 format, IopF shall only deliver it as res Payload to EcsF. EcsF manages the data provided by MapF and IopF to create the ILHI Payload which has been defined by ETSI  by re-using existing standard HI’s TS 102 232 part 1 to 7 . For the network layer, ILHI is proposed with two distinctive data flows (IRI and CC) using public Internet IP-VPN interconnection of the involved LEMFs or network connection secured by other means.